Help raise funds for Hale Kau Kau and participate in this super fun annual event! Step 1) Come by the office during business hours and pick up a pledge sheet OR download the pledge form here. 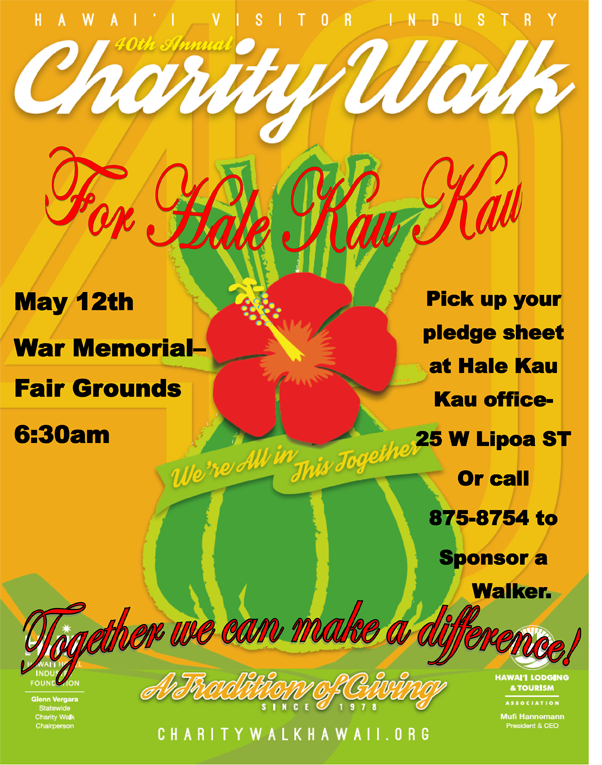 Step 3) Return your pledge sheet and donations at the Hale Kau Kau office by May 4th. See below for information on the day of the walk! If you have already registered online at the Charity Walk website , please add our code: 325 to your pledge form to ensure we receive the donations & matching funds! When & Where is the Maui County Charity Walk? 1. Leave ALL pets at home including dogs in strollers or on leashes. 3. Registration will be located at the starting point (see map). Let them know you signed up through Hale Kau Kau. 5. Parking for CHARITY WALK is at the stadium parking. Remember to make transportation arrangements for after the CHARITY WALK. 1. Obey all traffic regulations. Always walk on the sidewalks where possible. 2. Wear light-colored clothing so that you are more easily visible to drivers. 3. First aid supplies will be on hand with the First Aid Vehicle. All checkpoints can assist with contacting First Aid personnel. 4. Do not accept a ride from any car that is not marked as an official CHARITY WALK car! Transportation in official CHARITY WALK cars will be available to return tired/injured walkers to the starting point. 5. Keep our State clean - DO NOT LITTER! 6. The CHARITY WALK is not a race or endurance contest. Qualified personnel at checkpoints may advise you stop if you appear iII/injured.